The Hostel is semiburied in the hillside of a hill that emerges of the waters of the Reservoir of Alcántara, with an access from N-630, in the kilometric point 519'8, lowering 500 meters for a Roman roadway that coincides with the Vía de la Plata. 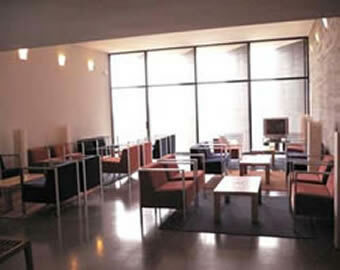 The Hostel is of modern and avant-garde construction. The lodging capacity is of 26 places divided in 5 rooms (2 with 4 beds and 3 with 6 beds), reception area, a living- room, three complete bathrooms (one completely adapted for disabled persons) and a pub. It has coffee-bar, heating, laundry, mountain bikes and hot water. 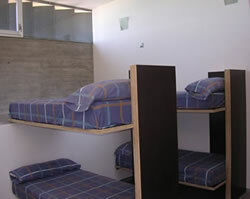 The rooms have bunks of two places, closets, blankets and Nordic comforters.